I am absolutely intrigued by Paris’s street art: those sometimes ephemeral, sometimes witty, sometimes political, but always free exhibitions that are found on almost every city block in this Mecca of artists. In fact, this is my third post on je parle américain about street art in as many months because I’m constantly stumbling across new pieces. A few weeks ago, though, I started to ask myself whether this love affair with street art has deeper roots than just my experiences here in Paris. I lived in Washington for many years before moving here, and there are a few murals in DC that I used to see on a regular basis. The most famous of these is certainly the “Warholesque” portrait of Marilyn Monroe surveilling Connecticut Avenue in Woodley Park. It was commissioned more than three decades ago as a fortieth birthday present for the owner of the building whose wall it graces. Nice gift, huh? 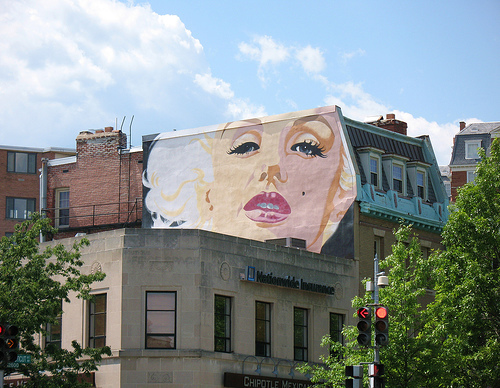 In my old neighborhood of Adams-Morgan, just to the east of Marilyn, there are two other well-known murals that are more explicitly “billboards” for two local businesses: Madam’s Organ Blues Bar & Soul Food Restaurant and the now-closed Café Lautrec on 18th Street. I don’t think I can count the number of times I walked past those two during my years of living in the neighborhood. When I really delved into my past, though, it didn’t take long for me to realize that some of my earliest experiences with art of this type were two murals in my home state of South Carolina, both painted by native son Blue Sky. I still have a vivid recollection of going on a field trip to see his mural “Winter Beach” during a creative writing summer workshop for middle school kids. There’s nothing like sitting on a sidewalk, eating donuts, and gazing up at 20-foot tall, 80-foot wide beach scene to get inspired to write poetry! 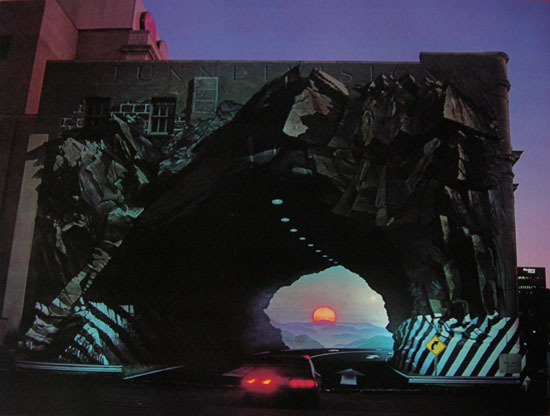 Blue Sky’s most famous and dramatic work, though, is the 50-foot tall, 75-foot wide trompe-l’œil mural entitled “Tunnel Vision,” depicting what the artist himself called a “window into transcendental reality.” I recall finding it both engaging and frightening as a small child. Now, I’m not sure if these examples really fit into the definition of “street art,” but I think I’ve at least found the root of my love for this stuff. In any case, knowing that I was really into street art, a friend here in Paris recently suggested an art exhibition at the Paris Post Office Museum (L’Adresse Musée de la Poste) entitled “Beyond Street Art” (“Au-delà du Street Art“). As a museum exhibition, “Beyond Street Art” doesn’t feature actual works of “street art” of course — I mean, you can’t easily bring that stuff inside — but it does include pieces that demonstrate not only the distinctive techniques of the featured artists, but also the evolution of the genre and the homage paid by current artists to earlier pioneers. Instead of weighing down your visual experience with a regurgitation of the exhibition guide, I’ll just show you what I saw … and encourage you to hurry down there to see it yourself if you like street art as much as I do. And when I say “hurry,” I do mean it; the exhibition closes next Saturday, March 30! In the gallery below, you’ll see photos of various works by the following street artists, some of whom you surely already know — if not by name, at least by their work: Blek le rat (considered by many street artists to be one of the fathers of the genre), Jef Aérosol, Jérôme Mesnager, Miss.Tic, C215, Invader (the mosaic artist inspired by the Space Invaders video game), Vhils, Swoon, Shepard Fairey (also known as “Obey” and most widely known for his Obama “HOPE” posters), Banksy (recently in the news for a scandal regarding one of his works that vanished from London and ended up in a US auction house), Dran, Ludo, L’Atlas, and Rero. Enjoy the exhibition, and click here for my other posts about street art in Paris. Blek le rat. The Beggar. Stencil on canvas. Mesnager, Jérôme. L’homme blanc (White man). Acrylic on postal sack. 2009. Collection L’Adresse Musée de la Poste, Paris. Jef Aérosol. Chuck Berry & Woody Allen. Stencil on wood. 2012. Private collection, Galérie Magda Danysz, Paris. Miss.Tic. Je suis la voyelle du mot voyou (I am the vowel of the word thug). Spray paint on fence. 2012. Created for exhibition, L’Adresse Musée de la Poste, Paris. Miss.Tic. Plus fort que la passion, l’illusion (Stronger than passion, illusion). Spray paint on poster fragments. 2010. Artist’s collection. Miss.Tic. Un remède à l’amour, aimer encore (A remedy for love, to love again). Spray paint on canvas. 2008. Artist’s collection. C215. Nostos. Stencil on mailbox. 2012. Created for exhibition, L’Adresse Musée de la Poste, Paris. C215. Marlène. Stencil and acrylic on wood. 2012. Artist’s collection. C215. Smoke gets in your eyes. Stencil and acrylic on cardboard. 2012. Created for exhibition, L’Adresse Musée de la Poste, Paris. Invader. ROR. Rubik’s Cubes. 2009. Private collection. Invader. Alias NY_117. Mosaic on plexiglass. 2011. Collection of N Guéron. Invader. Rubik Space Camo Two. Mosaic on board. 2005. Private collection. Invader. Blue and Black Duo. Mosaic on board. 2004. Collection of N Guéron. Invader. Rubik Little Jesus. Rubik’s Cubes. 2008. Collection of N Guéron. Vhils. Disposable utopia series 10. Acrylic on posters collected on the street. 2011. Collection of A. Oliveux, courtesy of Galérie Magda Danysz, Paris. Vhils. Scratching the surface series 4. Brick wall covered in cement and plaster, carved with jackhammer, chisel and box cutter. 2012. Created for exhibition, L’Adresse Musée de la Poste, Paris. Vhils. Scratching the surface series 4 (detail). Brick wall covered in cement and plaster, carved with jackhammer, chisel and box cutter. 2012. Created for exhibition, L’Adresse Musée de la Poste, Paris. Vhils. Mayhem series 4. Posters collected in the street, cut by hand and laser. 2012. Private collection, courtesy of Galérie Magda Danysz, Paris. Swoon. Ben. Original engraving on linoleum, printed on Mylar and painted by hand (unique, unnumbered copy). 2012. Private collection, courtesy of Galérie LJ. Swoon. Alixa & Naima. Original engraving on linoleum, printed on Mylar and painted by hand (unique, unnumbered copy). 2012. Private collection, courtesy of Galérie LJ. Fairey, Shepard. Big Brother is watching you. Serigraph on wood. 2006. Private collection, courtesy of Galérie Magda Danysz, Paris. Fairey, Shepard. Rose Soldier. Stencil on paper collage. 2006. Private collection. Fairey, Shepard. Serigraph with ink and paint retouching (hand painted multiple). 2008. Private collection. Fairey, Shepard. Rise Above Rebel. Painting on canvas. 2012. Private collection, courtesy of artist and the Perry Rubenstein Gallery, Los Angeles. Banksy. Weapons of mass destruction. Sheet of fake stamps. 2001. Collection of Butterfly. Banksy. Welder Rat. Stencil on metal. 2006. Collection of N Laugero Lasserre. Banksy. Girl with balloon. Serigraph. 2003. Collection Butterfly. Banksy. Flying Copper. Serigraph. 2003. Collection of Butterfly. Banksy. We love you, so love us. Serigraph on vinyl disk cover. 2000. Collection of Butterfly. Banksy. Future, Dirty Funker. Serigraph on vinyl disk cover. 2008. Private collection. Banksy. Choose your weapon. Serigraph. 2010. Collection of Butterfly. Banksy. Banksy of England, Ten Pounds. Serigraph (front and back). 2004. Private collection. Dran. Rebelle. Stencil and spray paint on paper. 2011. Collection of Butterfly. Dran. I love you. Serigraph and pastel on paper. 2011. Collection of Butterfly. Dran. Ville propre (Clean city). Mixed media on canvas. 2011. Private collection. Dran. Croute. Mixed media on pizza box. 2010. Private collection. Ludo. Tsing Tsing Fly. Graphite and acrylic on paper. 2011. Collection of D and G Alexandre. L’Atlas. Punitions (Punishments). Lacquer and acrylic on canvas. 2010. Collection of Art Visory. Rero. Untitled (IMAGE NOT AVAILABLE…). Mixed media on canvas. 2010. Collection of Art Visory, courtesy of Backslash Gallery. Rero. Untitled (COPY MY RIGHT..). Mixed media on canvas. 2010. Collection of G Proust, courtesy of Backslash Gallery. Rero. Untitled (PAGE NOT FOUND…). Installation. 2011. Collection of Art Visory, courtesy of Backslash Gallery. Rero. Untitled (PAGE NOT FOUND…) (detail). Installation. 2011. Collection of Art Visory, courtesy of Backslash Gallery. Rero. Google. Vinyl letter and resin on antique book. 2011. Collection of C Laurier, courtesy of Backslash Gallery. Rero. Untitled (THE END…) (detail). Mixed media. 2012. Private collection, courtesy of Backslash Gallery. Very cool. I’ve never seen that one. Next time I’m in Columbia, I should really visit that site.